The spring flying season is in full swing and we have had some really wonderful times with those who helped raise funds for Honor Flight Arizona, enabling us to send up to 30 WWII Vets on each of our first two flights! Where would Honor Flight Arizona be without your wonderfully generous donations?? Thank you all for helping us continue to thank our WWII Veterans with a flight of honor and remembrance. One of our new friends, Smoke Haus Restaurant and the Brathaus, next door to each other in Scottsdale, held an all-February fundraiser, giving a $1 for every pint of beer sold, with that amount being matched by their supplier. During Smoke Haus restaurant’s Grand Opening on February 24, they invited some WWII Veterans and their spouses to sit front & center, meet the incoming patrons, and enjoy some wonderful food! In the entirety of the fundraising, they raised enough ($4500) to send FIVE WWII Veterans on their very own Honor Flight, two of whom were present at the Grand Opening and will be flying with us at the end of April. Needless to say, they are both very excited! We were pleased to receive a call from the Phoenix Blues Society, telling us they chose us to be their charity of choice this season during “Blues Blast” at Margaret P Hance Park in Phoenix. They had some really great prizes for raffles, and allowed announcements frequently throughout the day to talk about Honor Flight Arizona. With the help of our incredible “green shirt” volunteers, board members, and the Phoenix Blues Society’s own incredible raffle ticket sellers, the raffle, which was a 50-50 split for both Honor Flight Arizona and the Phoenix Blues Society, and raised more than enough to send a WWII Vet. On March 16, 2016, Mountain Ridge High School in Glendale, with Live 101.5 Radio, hosted a fundraiser for Honor Flight Arizona. We had four WWII veterans in attendance: Bruce Warren, Les Phillips, Loren Eichwald, & Max Littlejohn [special thanks to Beth for bringing dad (Loren) to this event] and a great time was had by all! Thank you again Mountain Ridge and Live 101.5!! Once again the Yavapai County Daughters of the American Revolution sponsored an entire trip of WWII Veterans on an Honor Flight. This included 7 ROTC Cadets from Emby-Riddle, which has their own story told in this month’s newsletter. Thank you again Yavapai DAR!! 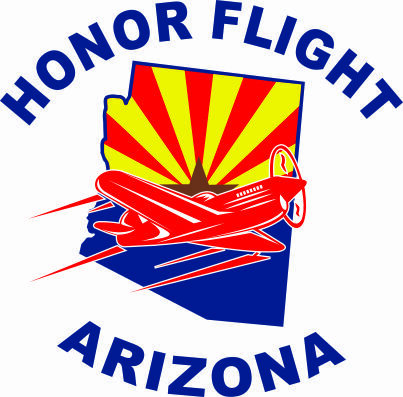 We have incredible groups, businesses, and individuals who consistently work to raising funds to give to Honor Flight Arizona so we can continue to fly. To them and to ALL who donate to this worthy cause, whether great or small, we give our heartfelt gratitude and thanks – we couldn’t do it without you!